All this class does is create an instance of TAdvGDIChart (can be TAdvChart for a non GDI+ version). In the Draw method implementation it uses this chart to perform the drawing. The CellWidth / CellHeight function implementations return 0 as the chart will size automatically with the cell dimensions instead of having a fixed size. The IsBackground function returns false as we do not assume it is desirable to put text on top of the chart. 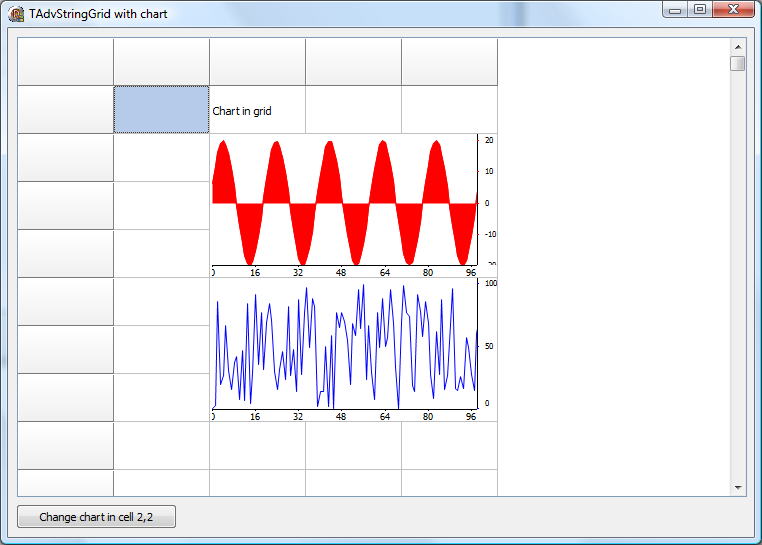 When this class is available, it is easy to start using it to insert a chart in a grid cell or cells. To do this, create an instance of TChartCell and add it to the grid via the grid.AddInterfacedCell method. Make sure to destroy this instance for example from the FormClose event.